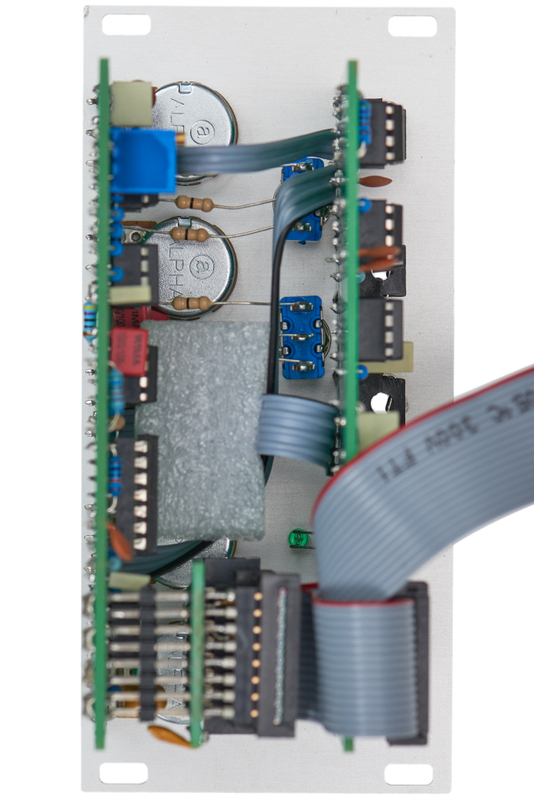 The RS-35N External Processor contains three circuits for extracting control voltages from an audio signal: frequency-to-voltage generator, level-to-voltage generator and a trigger generator. It has a new faceplate. Frequency-to-voltage (FREQ-V): This circuit of the RS-35 circuitry is also known as "pitch-to-voltage converter". It analyzes an audio signal and creates a frequency dependent control voltage. The higher the frequency the higher the voltage is. the input accepts signals of ±10V. 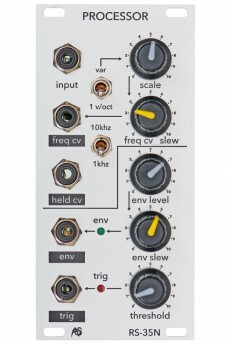 The V-Slew control can smmothen abrupt changes in the output signal and thus create a portamento up to 2S length. The "V-range" switch determines thevoltage range at the output. In the 1V/oct mode it will generate a control voltage with !V/osctave characteristic and a range of -4V to 3V. 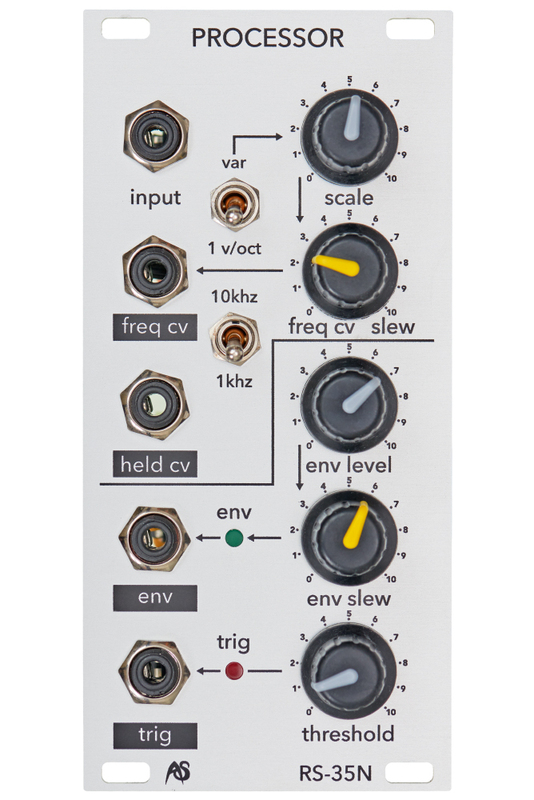 In VARY mode the "vary depth" control sets the onversion range from 0V to 0.5V/oct. In this mode the voltage range at the output is -10V to 6V. The switch "F-Range"sets frequency range to be analyzed. "kHz" converts frequencies from 20Hz to 1,2kHz with a accuracy better than 1%. "10kHz" converts frequencies from "100Hz to 10kHz with an accuracy better than 2%. HELD-V: Without an input signal the voltage will not drop back to zero but instead it will be held until the next trigger is generated by the according section (see below). Accuracy is 5% in low bass (20Hz to 100 Hz) and 1% in 100Hz - 1.2Hz range. In the 10kHz mode of the FREQ-V circuit the accuracy is constantly 2% over the whole 10lHz range. Level to voltage (LEVEL-V): This unit is commonly known as "envelope follower". 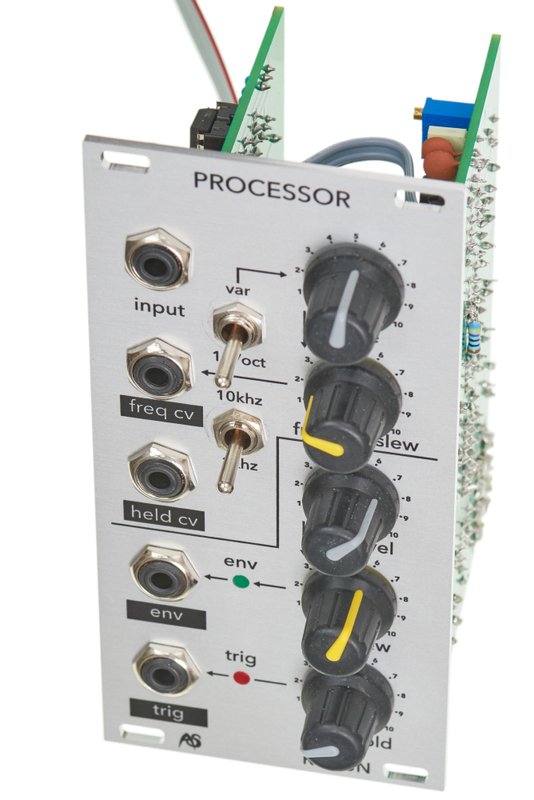 It produces a control voltage depending on the amplitude of the audio signal. A LED shows activity. Abrupt steps in the signal can be smoothened with the LV-SLEW contol (max. 1s). LV-LEVEL sontrols output level from 0V to 10V. TRIGGER: A 5V pulse wave is generated from the audio signal in the range betwenn 1Hz and 10kHz. The circuit´s sensitivity is adjusted with the TRIG-SENSE control.